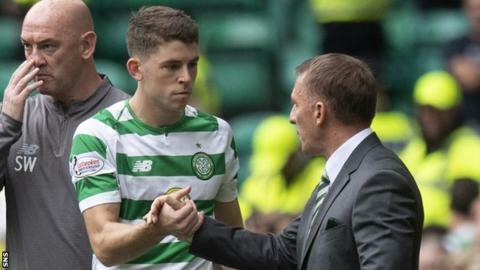 Ryan Christie says Brendan Rodgers "sees that I've got a part to play"
Ryan Christie hopes Moussa Dembele's departure from Celtic "opens up a window of opportunity" to get more game time and earn a Scotland recall. Manager Brendan Rodgers intimated that Dembele's deadline-day exit to Lyon may boost Christie's first-team prospects. The 23-year-old, loaned to Aberdeen for the previous 18 months, has made five appearances so far this season. "From a selfish point of view, it's quite good for me," said Christie, who is not in the current Scotland squad. "Hopefully the manager can have confidence to put me in, even if it is right up front. It's up to me to grab that opportunity. I love playing up there. "He spoke to me about playing right up top almost as a false nine. I played a couple of games there in pre-season and really enjoyed it. "The manager told me he sees that I've got a part to play in the squad and that's all I needed to put my head down and start working. "The loan to Aberdeen did me a world of good. I've come back stronger and more developed as a football player. I feel ready now to really have a push for a regular place for Celtic." Is the Nations League a back door to the Euros? The former Inverness Caledonian Thistle player has played as an attacking midfielder and in forward roles and insists he is "happy anywhere across the attacking line-up". Christie won his third Scotland cap in the June friendly defeat by Mexico but is not in the squad to face Belgium on Friday and Albania on Monday. "I had a taste of that last season and over the summer and really enjoyed it," he said. "So it's something that I'm definitely hopefully trying to work my way back into. "For that I need to, first things first, be playing more game time for Celtic so that's my main aim right now." With Celtic in the group stage of the Europa League, Christie expects Rodgers will rotate his squad as he juggles domestic and European fixtures in the coming months. "The more games the better for us," Christie added. "It's important that we do call on everyone in the squad. That shows why we've got such a good squad because the manager needs to rotate. With so many games, it's impossible to keep a starting XI for months on end. "Everybody knows that and everybody from the starting 11 right through the squad knows that they'll probably be called upon at one time or another."